Slapped cheek is a viral infection caused by the parvovirus. It causes bright red cheeks and is most common in children. Some adults can get slapped cheek. If a woman catches slapped cheek during the first half of her pregnancy, there's a small risk of miscarriage. There's also a small risk of her baby getting low iron levels, a type of anaemia. You usually get symptoms four to 20 days after being infected. Symptoms include a fever, runny nose, sore throat, headache and generally feeling unwell. In adults, symptoms can also include swollen, painful joints. These symptoms last for two to three days. 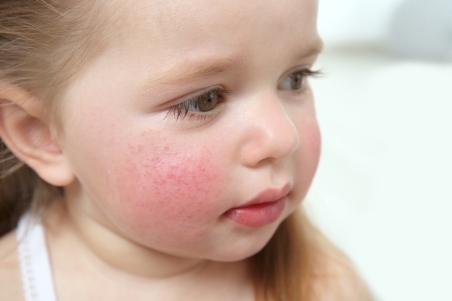 After a couple of days, a bright red rash appears on both cheeks. The rash usually lasts for two weeks. How is slapped cheek treated? Slapped cheek is usually a mild infection that clears up by itself. The treatment is aimed at relieving symptoms. Rest and drink plenty of fluids to prevent dehydration. You can take paracetamol to help relieve the symptoms. If you're pregnant and have caught slapped cheek during the first half of your pregnancy, see your GP. You should also see your GP if you have a weakened immune system. How can I avoid spreading slapped cheek? To reduce the risk of spreading the virus, it's important to have good hand hygiene. This includes washing your hands with soap and water, particularly after coughing or sneezing. This page explains slapped cheek, including its symptoms, treatment and prevention. Ministry of Health – Slapped cheek. Retrieved November 2017.